I guess the cool, current trend must be to give stuff away if you're a famous blogger like Tim Challies or The Pioneer Woman. Well, I'm far from cool & even farther from famous. But - I do have free stuff to give away! So today will begin an indefinite weekly blog feature I'll call "Freebie Friday" where I'll give away some great books. How long is indefinite? It's as long as I have books to giveaway. 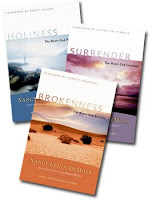 To kick off our first Freebie Friday, I will not just give away one book - not even two books - but three - YES THREE books from Nancy Leigh DeMoss! But wait, there's more! All three books have been signed by Nancy! Having worked with her & the Revive Our Hearts ministry for almost seven years now, I cannot recommend her writing enough. Brokenness, Surrender and Holiness make up a trilogy of books that "explore key themes on coming to God. Brokenness: experiencing the deep repentance that comes before every movement of God. Surrender: submitting to God in order to have victory over stubborn habits and secret sins. 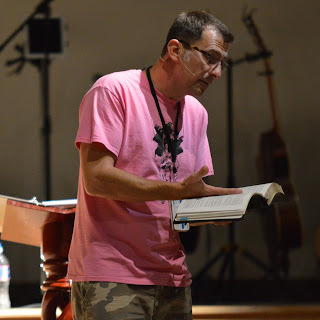 Holiness: living a life of purity and having a heart set on fire for God"
Leave a comment here or on this link on my Facebook page under this blog link. Winner will be announced on the following Friday. If you win, wait a few weeks before entering again - share the love people. In your comment/entry, you must respond to my topic. Leave your comment and tell me your 3 favorite kid's cereal. Hmm... I'm not sure what the criteria is for a "kids" cereal as opposed to just a regular cereal, but I'll give this a go. I'm going to work under the assumption that you're wanting the 3 cereals I liked as a kid. I think that would be Frosted Flakes (after all, they're G-R-R-R-REAT! ), Lucky Charms ('cause they're magically delicious), and Fruit Loops. Okay, so I don't know you, but I know your wife, and saw this on Facebook. (if it helps, I'm the little sister of Bill and Traci Berry). Mandi - I remember Traci, but never knew about you until I saw you on Anita's Facebook! From the looks of your blog, we have quite a bit in common. Really as a kid my decision was based on which cereal had the best prize inside! I would spend the whole grocery shopping trip on the cereal isle looking at the cereal box prizes. Ha ha! Yeah, no one really knew me. I was EXTREMELY shy. Larry Campbell would tell people that I was kept in the closet. My Mom would get so mad, because people acted like they believed him! I'm the youngest, class of 95. Lucky Charms, Coco Crispys, Frosted Flakes. Awww, Aaron, you're waaaay cooler than Pioneer Woman ever thought about being. ;) She has entirely too many pictures in her blog posts anyway - I don't need to see how to break an egg, thank you very much. Oh, you wanted three, I gave you five. Two extra just to say THANKS for the giveaway! Cocoa Dyno-Bites cause you get that really big bag and your conscience isn't ruined for eating three bowels cause of the cost. Also one of the best cereals when semi-soggy, not to mention the chocolate milk left behind. Malt-o-meal (maybe this one doesn't count?) cause its good with butter, cinnamon and brown sugar. Great winter breakfast. Honey Nut Cheerios. Just plain-ol good right out da box.